Bear loves to go for walks with his parents, Gary and Marsha Hettman. 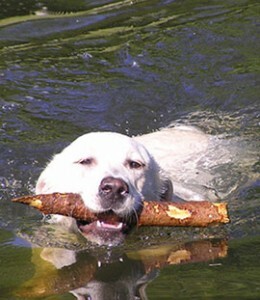 And, of course, being a retriever, nothing makes him happier than a nice, long swim. Four years ago, while hanging out in the living room with his family, Bear just fell down for no discernible reason. “Looking back, we had heard him fall several times out of our sight, which we attributed to him slipping on our hardwood floors,” says Marsha. But she was shocked to watch him drop right in front of her. So she took Bear to the family vet, OSU alum Dr. Dan Lewer, who detected a problem with Bear’s heartbeat and immediately contacted the cardiology department at the OSU Veterinary Teaching Hospital. The following Monday, Bear was in surgery and a pacemaker was implanted next to his heart. The procedure went well and, after several weeks of rest, he resumed normal activity. “He was out running and playing and enjoying life to the fullest,” says Marsha. Pacemakers are relatively simple devices that consist of a battery, a computerized generator, and a wire. The wire, also called a lead, feeds through a vein connecting the generator to the heart. When sensors on the lead tell the computer that the heart is not beating properly, the generator sends electrical pulses to the heart. Each year 600,000 pacemakers are implanted in humans. But, despite 78 million pet dogs in the U.S., only 300 pacemakers are implanted in dogs each year. Veterinary cardiologists are still researching, studying and working on ways to optimize pacemaker procedures in dogs. Bear was about to help them advance veterinary medicine. Joe Davie is 27 years old and that makes him a senior citizen. Joe is an American Quarter Horse. 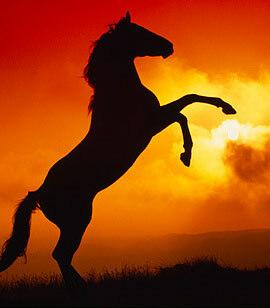 Calm, sturdy, and athletic, Quarter Horses are best known for competing in rodeos and riding off into the sunset in western movies. Davie has been riding Joe for nearly 20 years, exploring the Oregon countryside together. “He’s not spooky; he will go ahead through things. He’s a super trail horse,” she says. Last year, Joe was off his feed and obviously not feeling well, so Davie took him to the OSU Veterinary Teaching Hospital thinking he had colic. Doctors ordered a series of tests and found cancer cells in his stomach fluid. A clinical pathologist in the OSU Veterinary Diagnostic Laboratory identified the cells as lymphoma, a type of blood cancer that is rare in horses.